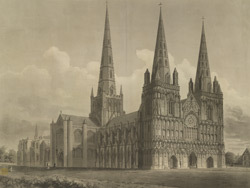 North west view of the cathedral at Lichfield. Daniel Defoe wrote, when he visited the town in the early 18th century, 'the cathedral-church, one of the finest and most beautiful in England, especially for the outside, the form and figure of the building, the carv'd work'd, imagery, and the three beautiful spires; the like of which are not to be seen in one church, no not in Europe'. He continued that 'the west prospect of it is charming, the two spires on the corner towers being in themselves perfect beauties of the architect, in the old Gothic way of building, but made more glorious by a third spire, which rising from the main tower in the body of the church, surmounts the other two, and shews itself exactly between them'. However despite the fine workmanship, 'the imagery and carv'd work on the front, as above, has suffer'd much in the late unhappy times; and they told us the cross over the west window was frequently shot at by rude soldiers'.